Fattoria San Michele a Torri, an Organic Farm since 1992, is situated in the heart of the Chianti region just 15 km from the city of Florence. We own over 370 hectares of land of which 55 are vineyards responsible of the production of chianty italy wine, 40 are active olive groves responsible for producing Laudemio. The rest is arable land and forest suitable for breeding Cinta Senese. The territory of the Fattoria San Michele is 211 meters above sea level, right in the middle of the most well known wine regions of Classic Chianti and Chianti Colli Fiorentini. Paolo Nocentini, the current owner, is the one responsible for developing new and innovative ways to cultivate the traditonal agriculture. He personally has renovated and expanded the crop directing it to the organic production of typical Tuscan products such as organic honey, organic chickpeas and creating what can be easily considered an organic farm. Our respect for the balance between natural cultivation and breedings is what creates the excellence of our products which consists of : a variety of chianty italy wine such as Chianti Colli Fiorentini Docg wine, Classic Chianti Docg. Also our organic farm produces extra virgin olive oil, meats, Cinta Senese salami Dop,organic honey, saffron, spelt, small garbanzo beans from Chianti and corn flour from Marano. 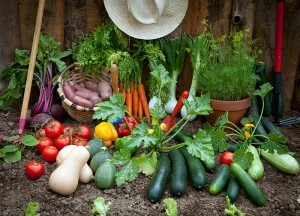 All of these products are authentic specialties and are a result of 100% organic farming. This particular territory has always been dedicated to viticulture which is why the quality of wine produced there has always been very high. The wines are fruity with a soft tannin structure. 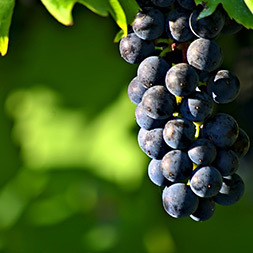 In addition,to the Sangiovese vines ,Canaiolo, Colorino, Malvasia Rossa, Ciliegiolo, Pugnitello, Trebbiano and San Colombano are grown. Recently others have been added such as: Cabernet Sauvignon, Merlot, Syrah, Chardonnay, Riesling, Pinot Bianco and Petit Manseng. Our organic homemade pastificio, or “pasta factory,” is in Via dei Rustici, downtown Florence. It produces pasta from the organic grains of Semolina, using antique pasta makers that have been restored, while always following the traditional compression method. There are four main phases in this process: the creation of the dough, done by combining all of the ingredients; the kneading ,which also gives the dough its elastic consistency; the rolling, which gives the product the required roughness; the cutting, which creates the shape by using a multi-stamp cutter. 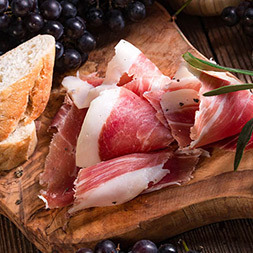 Our 24 month aged prosciutto, air dried capocollo filet and our delicate finocchiona (Fennel flavoured salami)are just some of our specialties. One of Fattoria san Michele a Torri s most prestigious products is without a doubt our Bio Extra Virgin Olive Oil. 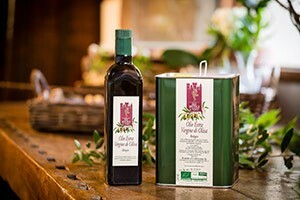 One of Fattoria san Michele a Torri s most prestigious products is without a doubt our Bio Extra Virgin Olive Oil. A low and tender acidic base, 0,15%expressed in oleic acid which contains polyphenols (300mg/lt) and tocopherols (280mg/lt). Our olive oil has a fruity herbaceous scent that reminds you of the olive itself. The delicate taste is immediately appreciated with its fruity flavor that finishes with a hint of spice.Our finest selection of olive oil is bottled under the name “Laudemio”, mostly a blend of Frantoio and Moraiolo olives with a small percentage of Leccino, Pendolino and Cerretana olives. It is a product of superb quality. Cinta Senese is a breed of Italian pigs from ancient times. A Fresco named “Allegory and Effects of the Good” depicts a Cinta pig already in 1338. The Cinta Senese is a breed of Italian pigs bred in ancient times. Already in 1338, a fresco named “Allegory and Effects of the Good”, depict a Cinta pig. In the last 25 years or so a couple Tuscan breeders have re-discovered the value of these pigs and the quality of their meat. The Cinta Senese DOP has now been recognized by the Comunita’ Europea since 2012. This acknowledgment, through the Consortium of Tutela not only enhances the product it guarantees the quality for the consumer. The name “Cinta” comes from an antique characteristic the pig has; a blend of pink colors that covers the chest. Our animals are bred semi-wild and grass-fed on simple cereals such as barely, corn and field beans. We do not use soy due to the fact it often contains Ogm. Luca Magazzini, the butcher of the Fattoria, personally looks after and cares for the production of all our meats. It is possible to buy these meats by ordering in advance at our stores: slices of loin, steak and ribs. Organic farming has always been our choice at Fattoria San Michele. Our products are “farm to table” they start on the farm and lands on your table. Organic farming has always been our choice at Fattoria San Michele. Our products are “farm to table” they start on the farm and lands on your table.This choice requires a profound knowledge of the natural environment and respect for the seasons. This process allows us to offer our consumers fresh seasonal vegetables delivered KM 0. Fattoria San Michele a Torri is committed to sustaining the biological cultivation. We believe that by only using natural products and respecting the biological balance and biodiversity of our environment, our staff can produce high-quality foods. The conscious decision to buy only biological, low environmental impact food helps future sustainability. 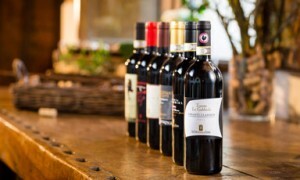 Fattoria San Michele decided to make organic Tuscan products its strength, so it is equipped with the necessary certifications to ensure compliance with the rules of production. San Michele a Torri is a small village situated in the Val di Pesa hills, just southwest of the city of Florence. The village got its name from the medieval castle that was first mentioned in 1126. Today, only some traces of the castle remain. 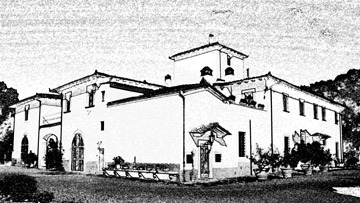 Most of the castle was destroyed in 1324 by Castruccio Castracani. Documentation referring to the structure exists from as far back as 1535 and it is certain that it was used as an important center of production in the 1800’s . Numerous interventions have reshaped the villa over the years, exemplified by the brick vaulted wine cellar, the 18th century chapel and the Neo-Gothic well , all beautifully restored in 1822 before being destroyed again during WWII. Recently the farm has been restored strictly respecting its original style and elegance. 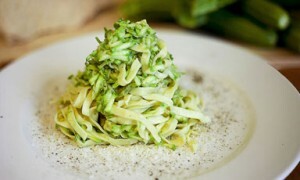 Tuscany has a rich and strong gastronomic tradition. The combination of its climate, altitude and soil give this particular area of the Chianti the perfect formula for producing high quality wine and fine foods. These are the typical Tuscan products that are World renowned. Chianti has its own particular wine which is known as the Chianti Classico DOCG. According to the Rules it is either made with 100% Sangiovese grapes or by adding a maximum of 20% of other red grapes. Nowhere else in the world can the characteristics of this wine be reproduced since these Sangiovese are native to this specific area. 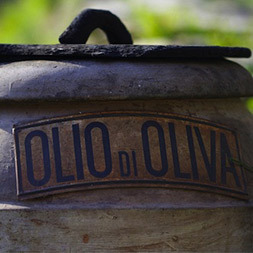 Another excellence of Tuscany is represented by Extra Virgin Olive OIl. Olive growing tradition finds its origins in ancient times. Tuscan olive oil has a distinct flavor of fruitiness with a bite of spice. It is stored in antique terra-cotta jars. 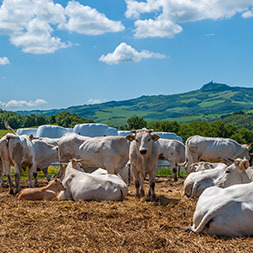 Chianina is a breed of cattle and one of Tuscanys most ancient and eminent products Originally used as traction power, its name derives from the Val di Chiana. 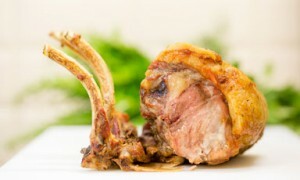 It offers a lean meat from which is made the famous “Fiorentina” steak. Given this name because of the pink stripe around its chest, the Cinta Senese pigs are bred in a semi-wild environment and fed with grass, barley, corn and field bean cereals. When producing coldcuts we only use animals bred by us . Luca Magazzini, the Fattoria’s butcher, is personally in charge of supervising and taking care of the processing of the meats . What makes this bread unique is the absence of salt. In the XII century, salt was a very expensive product so florentines started using less of this ingredient. Now, overtime, this ihas become the bread’s most common characteristic. 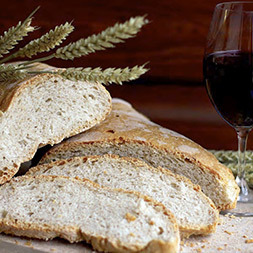 One would think this bread would be flavorless, yet the special yeast and processing make this bread rich with flavor and an unmistakable aroma.